War Baby: Lutz's Burkha/Womb at St. John's the Divine. Who’s that attracting so much attention at St. John the Divine? 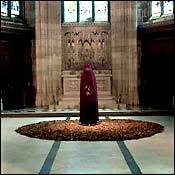 She’s not real, she’s Burkha/Womb, by New York artist Adelle Lutz, made to honor female war victims. “It makes me feel like I’ve been on a pilgrimage,” says recent visitor Nan Graham, Scribner’s editor-in-chief. If the statue looks familiar, that might be because the day the U.S. started bombing Iraq, Lutz walked through Manhattan with five real, live women in burkas, all printed with U.N. statistics on civilian casualties of war.